So, my 9-month old erased my iPhone the other day. That was fun. Hannah LOVES playing with my phone and I always figured that as long as it was locked she couldn't do much harm, right? Wrong! Apparently, my phone has a security setting enabled that will erase all data after 5 failed password attempts. I guess Hannah's little hands grabbing on to my phone were enough to register as someone trying to crack into it and just like that, we were back to factory settings! I melted down, handed the phone to my husband and asked him to call Apple Support, and left the room. Did I mention I'm REALLY bad about backing up my phone? After about 48 hours of worrying that almost all documentation of Hannah's first 9 months of life had been erased, I was moderately reassured that at least the highlight photos had been added to and safely stored in Lifecake, an app we use to share daily baby photos with our close family and friends. Thanks, Lifecake! And somehow, after many updates and upgrades to my sad old laptop, it appears that (no thanks to me) all of my iPhone photos found their way safely to my hard drive. Thank you too, Apple! Now that I can breathe again, I'm back with a recipe post (and yes, I digress) and of course, sharing my cautionary tale as a reminder to always always back up your data. Now, on to the food... I love a good risotto, but it's been a while since I have made one. They're time consuming and time is definitely not something I have to spare these days, so long leisurely cooking sessions don't often happen anymore. That is, except for Sundays when I usually set aside some time for meal prepping-- for both the week's dinners and also my lunches. And when I was looking for a way to use up a surplus of butternut squash, a risotto seemed the perfect way to do so! Instead of using standard arborio rice I used farro. I love the nutty flavor, the chewy texture, and the fact that it is a healthier carb full of fiber, vitamins, and minerals. 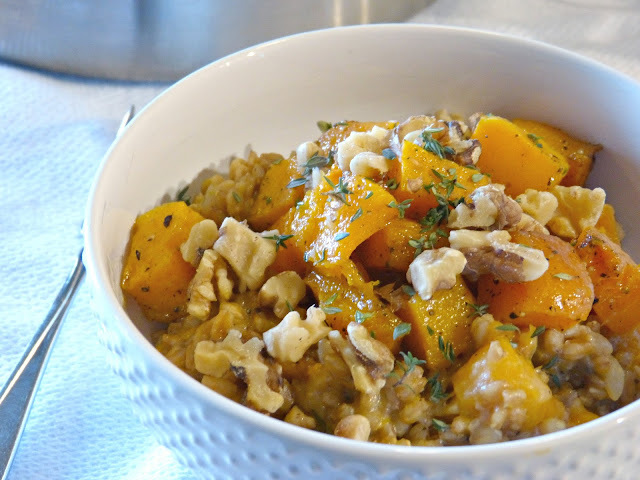 It's the perfect base for a creamy risotto filled with roasted squash, earthy thyme, and some chopped toasted walnuts. I made a huge batch of this and enjoyed it all week for lunch, which worked really well. It reheats nicely and for a meatless meal, it's really filling and perfect for getting me through the workday. It would also make a great vegetarian entree on a chilly Meatless Monday evening or a lovely companion for roasted chicken or pork. To save time, you can roast the squash ahead of time (which is what I did) and then you're just left with the job of stirring the farrotto until it absorbs the broth and becomes tender and delicious. In a medium saucepan, bring vegetable broth just to a simmer. Cover and keep hot over medium low heat until you are ready to use it. Heat a large saute pan over medium-high heat. Add 1 Tbs. oil. Add onions and saute for about 5 minutes, stirring frequently. Stir in the garlic and thyme and saute for 2 minutes, stirring constantly. Add the farro to the pan and stir to coat. Pour in the wine and simmer, stirring until it has almost completely evaporated, approximately 3 minutes. Add 1/2 cup of broth and stir constantly until the broth has almost completely absorbed, for 2-3 minutes. Continue stirring the farro and repeat the process of adding 1/2 cup broth at a time. Allow each 1/2 cup of broth to absorb before adding the next. Pour in the last 1/2 cup of broth along with 1 cup of the roasted squash and continue stirring to cook until the farro is chewy and firm. 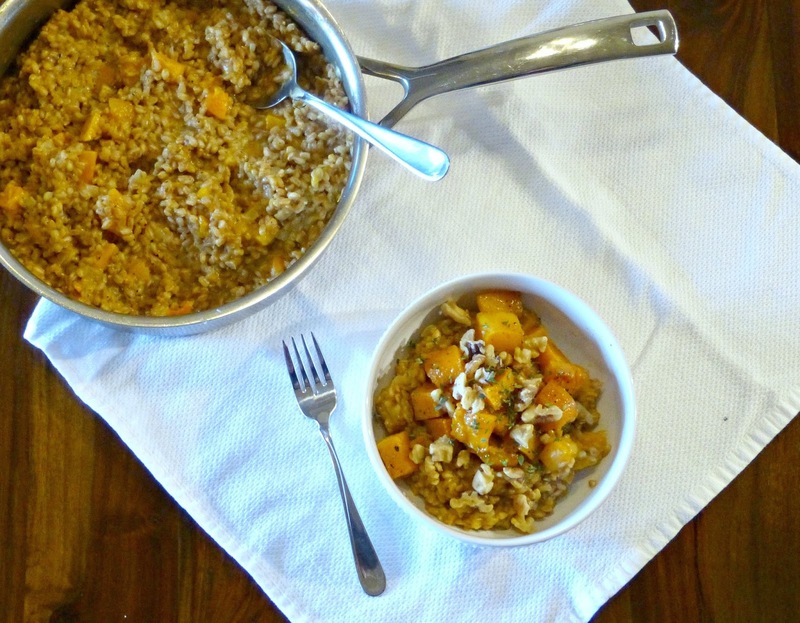 While stirring, use the spoon or spatula to gently break up the squash so that it incorporates into the farrotto. Remove from the heat. Stir in the grated cheese, remaining oil, and season with salt and pepper. Transfer to serving bowls and top with additional roasted squash. Sprinkle the toasted walnuts on top and serve. Well, check another off another box on the list of parental milestones: Baby's (and parents') first stomach bug. We'd been pretty fortunate with Hannah in the health department until two weeks ago when one morning last week when she woke up sick from what seemed like out of nowhere. I spent two days home from work trying to get her to eat and laundering and disinfecting everything in our house, only to fall victim myself the following weekend. Alex followed a few hours later, so as you might imagine there was some truly stellar parenting happening on that Sunday. Thank goodness for Babysongs DVDs and the fact that Hannah is not super mobile yet! So, I've been a little preoccupied with getting my family well again and with catching up on all of the chores that piled up while we were all recovering. And I'm a bit behind on posts. But, I'm back today with a healthy and delicious soup recipe-- perfect for the winter blues and also for recovering from the stomach bug or whatever else might ail you. I actually made a big batch of this soup at the beginning of the year so that I could have something healthy and at the ready to pack in my lunches as I jumpstart my new year diet. This soup is filled with vegetables. It has wonderful flavor and a hearty consistency. That brothy quality of a standard vegetable soup always feels a bit lacking to me, so I love the velvety texture of this one-- and that texture comes almost completely from pureed vegetables with just a little bit of plain Greek yogurt stirred in at the end of the cooking process. This combination of vegetables has a lot of depth too. You could sub in other veggies that you like, but there is a nice balance here of sweetness from the carrots and sweet potatoes with that almost licorice-like bit of the parsnip and celery. And the cauliflower is mild, but gives great body to the soup-- almost like what you'd find in a a creamy potato soup or chowder. 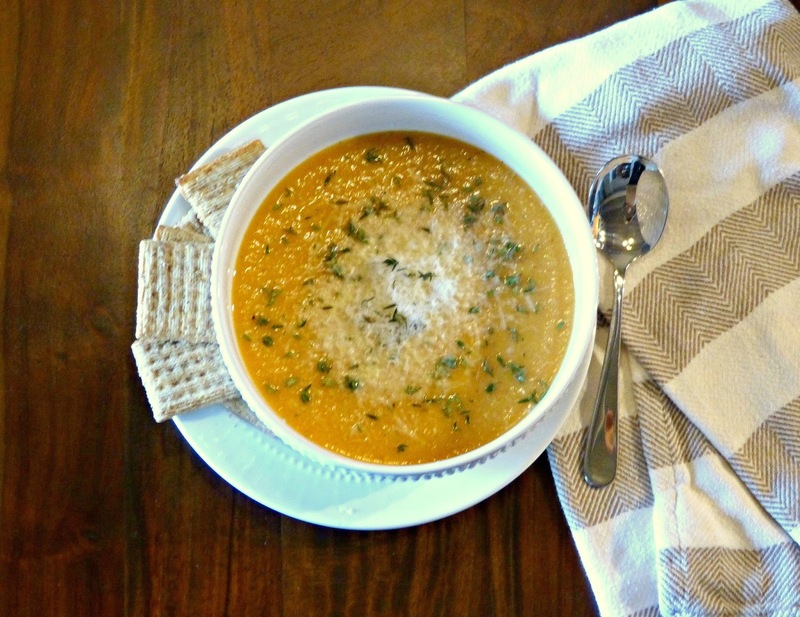 Add in some fresh lemon and herbs for some brightness and this is a healthy hearty soup that you are sure to love in this dreary winter months! Heat oil in a large soup pot over medium-high heat. Add onion and saute for about 5 minutes, stirring often. Add garlic and saute for another 2 minutes, stirring so it doesn't burn. Pour in the stock and the remaining ingredients through salt and pepper. Bring to a boil and then reduce heat, simmering for 25-30 minutes until the vegetables are soft. Remove the pot from heat. Use an immersion blender or standard blender to carefully puree the mixture until smooth. Stir in the lemon juice and yogurt. Season with more salt and pepper, to taste. Garnish with a little grated cheese, toasted nuts or seeds, fresh herbs, or croutons and enjoy! 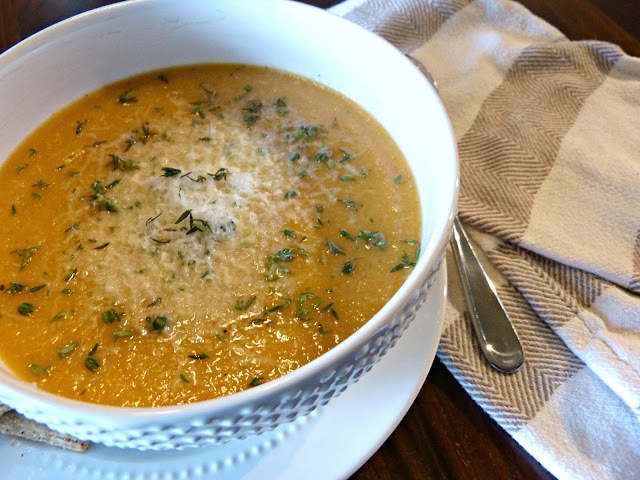 Editor's Note: Recipe inspired by this soup recipe by Bethenny Frankel.